The visit to Carrow Road was never going to be easy, with Norwich having won their last four matches. There was certainly no shortage of effort and commitment from Wigan who looked like coming away with a valuable point until a controversial refereeing decision in the 86th minute decided the outcome. The stats show that Latics had 11 shots compared with 14 from Norwich, but the home team goalkeeper did not have a shot to save. Chey Dunkley was playing his 49th consecutive league game for Wigan under Paul Cook’s management. Dunkley had played non-league football for five years before joining Oxford United, where he became a popular figure with the fans. Dunkley is a rugged central defender, powerful in the air, strong in the tackle. When he signed for Latics as a free agent in the summer of 2017 questions were asked as to whether he would have sufficient quality to become a regular in Cook’s team. But Dunkley went on to form a formidable central defensive partnership with Dan Burn, missing only three league games over the course of the 2017-18 season, those being down to suspension. More questions were being asked over the past summer as to whether the player could handle the step up to the Championship. His performances in the opening 10 games of the 2018-19 season have shown that he certainly can. Dunkley continues to develop as a player. His positional play and reading of the game is excellent, qualities that have helped weld together the youngest back four Latics may have ever had. Dunkley is clearly a learner, keen to further develop his game. Moreover, he shows enough resilience and determination to succeed to suggest he will continue to improve. Yesterday he looked jittery early on and half way through the first period he made a weak back pass, subsequently tackling Teemu Pukki from behind as he raced in on goal. Dunkley looked to have given away a penalty and the nature of his challenge could have easily been a red card offence. He was fortunate that referee Webb let him off scot-free. However, from that point Dunkley showed his resilience, growing into the game, making the kinds of interceptions and blocks that we have come to expect from him. He was Latics’ best performer overall. Last season Dunkley scored 7 league goals. He has come close to scoring several times this season, but his headers have not hit the target. Perhaps he is due for a goal against Swansea on Tuesday? As happened at Brentford, Latics were caught out on several occasions with rapid counterattacks along the flanks. Once more the centre backs were left exposed. However, with last ditch tackles and interceptions the defence managed to keep the Canaries out until the 86th minute. Given Cook’s preferred style of play with the full backs pushing forward there will always be a chance for the more skilful opponents to counterattack in the spaces left behind. Norwich are a team capable of doing that, as are Brentford. However, some of the problems yesterday were caused by Wigan players not moving forward as a unit, playing the opposition onside. It is something Cook will surely look at. After scoring five goals in their first two away games, Latics have not got one in their last three. The QPR performance was particularly disappointing, but both Brentford and Norwich were in-form teams capable of playing the kind of football that can upset any Championship defence. But after the naivety of their attacking approach in the early games we have seen them growing more and more cautious. Latics just did not look like scoring yesterday and Cook’s substitutions suggested he was ready to settle for a point, which they went close to getting. The loss of Gavin Massey to injury has been a bitter pill for the manager to swallow. The winger’s pace on the right-hand side has been sorely missed. Callum Connolly and Josh Windass have been played there, but neither has the pace or dribbling skills of a natural winger. There have been questions from fans why Callum McManaman, Nathan Byrne and Leo Da Silva Lopes, players of pace, have not been played there. At his best McManaman is a potential match winner, but injuries have apparently taken their toll. Moreover, it is going to take some time for the player to regain his confidence after a frustrating time at Sunderland. Can Cook get the best out of McManaman as he has with Nick Powell? Byrne seems to have become the forgotten man. Whether he has fallen out of favour with Cook is not privy to us as fans. But after being voted “Player of the Season” by both fans and fellow players he has hardly featured so far. Attacking full back is Byrne’s best position, but he has lots to offer as a right winger, with his pace and intelligent movement. Despite being only 19 years of age, Da Silva Lopes made over 100 appearances for Peterborough. He is hardly a rookie but has been held back by Cook so far. The manager’s supporters will say that the exciting, if erratic, youngster is being nurtured behind the scenes, but others would question why someone with his explosive ability is rarely included, even on the bench. Despite his excellent cross for Nick Powell’s winner against Bristol City, Windass has not looked the part as a right winger. His best position is surely centre forward, but Cook’s signing of Joe Garner put him well down the pecking order, with Will Grigg, James Vaughan and even Nick Powell also ahead of him. But Paul Jewell reinvented Lee McCulloch by playing him on the left wing, where his striking rate was as good, if not better, than it was when he played centre forward. 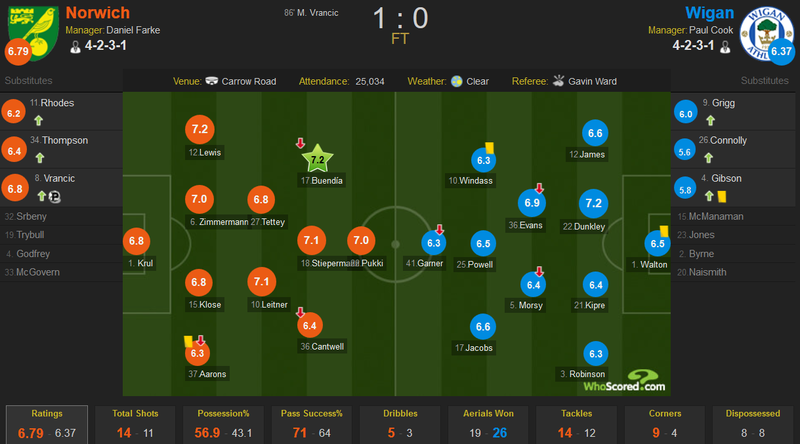 McCulloch played an important role for Jewell’s team, working hard in midfield, dangerous from crosses from the right. Windass has more pace than the Scot and a better career strike ratio at this stage of his career. McCulloch was more dangerous in the air, but Windass has a powerful right foot. Jewell relied on the pace of the likes of Gary Teale on the right, with McCulloch’s interactions with the left backs, Leighton Baines or Steve McMillan, providing the crosses. Whether that is a model that Cook wants to follow remains to be seen. But Windass looks like a duck out of water on the right, capable player that he is. Sam Morsy and Lee Evans form a strong partnership in Wigan’s midfield. Neither is often substituted by Cook, so to see both being taken off yesterday was surprising. Evans was one of the better performers yesterday but was taken off after 75 minutes for Callum Connolly. The Welshman’s creativity was missed in that final quarter. Was he taken off due to injury, with an eye on Tuesday’s game, or was it a tactical substitution? Morsy went off after 87 minutes for Will Grigg, which one assumes was a tactical change aimed at getting a late equaliser. But more than injuries, looking to the next game, or tactics, was Cook sending a message to his squad that nobody is an automatic choice? Dan Burn is still apparently a couple of weeks away from contention. He will depart for Brighton in January. Alex Bruce was once again absent yesterday, with no word of whether he is injured or out of favour. Bruce is a very capable ex-Premier League player whose career was affected by an Achilles injury. He might lack the pace in his younger days, but after being given a contract extension for another year one assumed that he had a part to play this season. In terms of playing ability Caulker looks a strong potential signing. He is still only 26, has played for England and has lots of higher league experience. The player’s difficulties off the field of play are well documented. Is Cook willing to take a risk with the player? It could prove a masterstroke, or it could be seriously problematic. But with Burn going in January, Cook will look at bringing in another centre back, whether in the immediate future or in January.